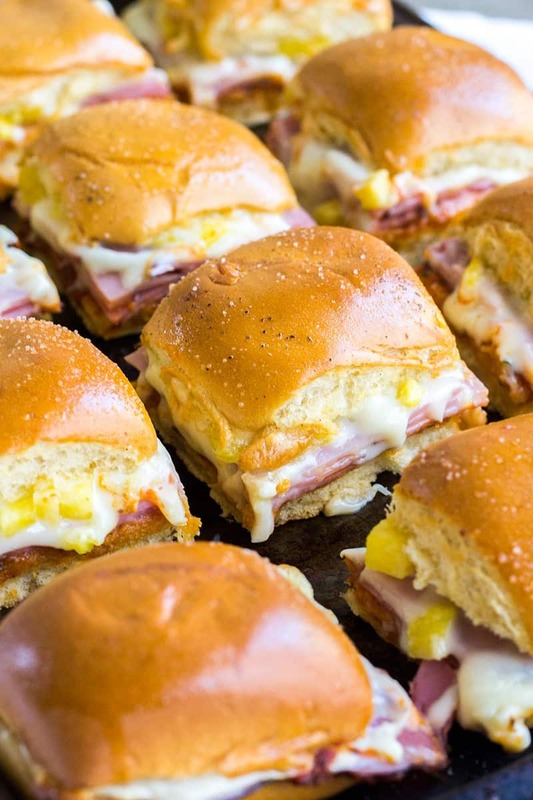 Your party isn’t complete until you serve up these Hawaiian Pizza Sliders! Loaded with all your favorite pizza toppings, they are always a crowd favorite! I could eat pizza just about every week. It’s pretty much the best food ever! Crust, sauce, cheese, and all your favorite toppings, what’s not to love?! And the possibilities are endless! Caramelized Onion & Italian Sausage, Bacon & Alfredo…just dream up a combination of things you love, put them on a pizza, and watch the magic happen! Whenever we order pizza, my husband tells me to pick whatever I want, but I know his favorite is Hawaiian pizza. So, today I’m bringing together our game day favorites in these super easy Hawaiian Pizza Sliders! With college bowl games in full swing, I’ve been making lots of sliders. They really are the perfect football food. Little buns loaded with meat, cheese, and usually some kind of sauce baked til golden and delicious. Sounds like pizza’s American cousin to me! (Okay, that might be a bit of stretch, but YUM!) These sliders start with Hawaiian-style rolls. I like the extra sweetness of the bread, but regular dinner rolls would work just fine too. Then layer on pizza sauce, seasonings, ham, mozzarella, and pineapple. 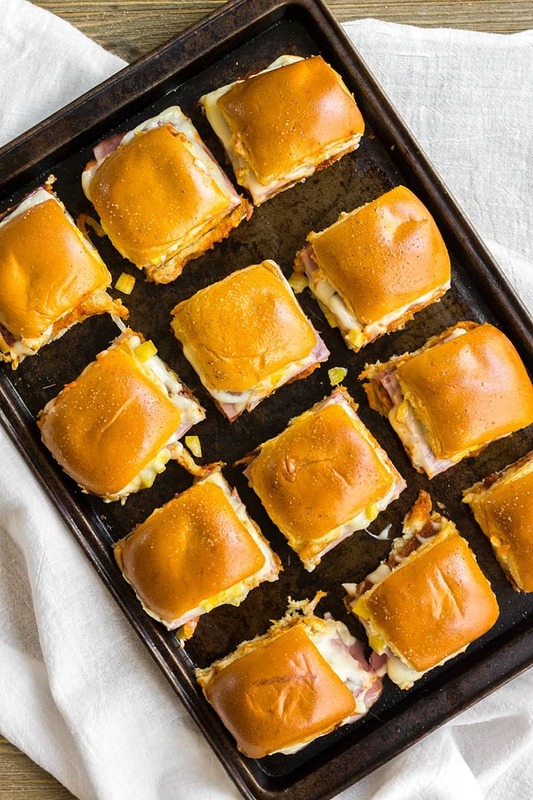 These Hawaiian pizza sliders will make you wonder why you ever waited an hour for pizza to show up when you could be eating these ham & pineapple sliders in about 20 minutes. Yeah. Get your ham from the deli counter. Sure you could buy the pre-sliced package from the meat section of the store, but that ham is cut super thin. You’ll need A LOT more of this pre-cut ham to get a good layer of meat on these sliders. So plan accordingly. Speaking of the deli counter, get your mozzarella there too! You could use shredded mozzarella cheese for these sliders, but the sliced cheese from the deli gives great coverage and melts beautifully! Fresh pineapple for the win! I used fresh pineapple in this recipe and it makes a world of difference. Just chop it up small, like really small so it gets into every bite without there being these weird big chunks. If you’re in a pinch, canned pineapple tidbits that have been drained will work. You’ll want to chop them up though. Are you drooling for sliders yet? Good! 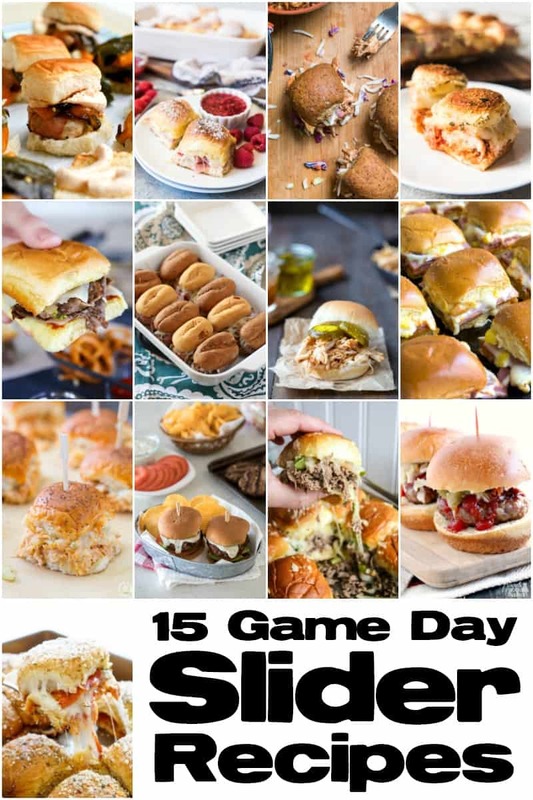 This month we’re cooking up our favorite slider recipes to make sure your game day spread is the best! Try one or try them all! Your taste buds will do a happy dance all the way through halftime! 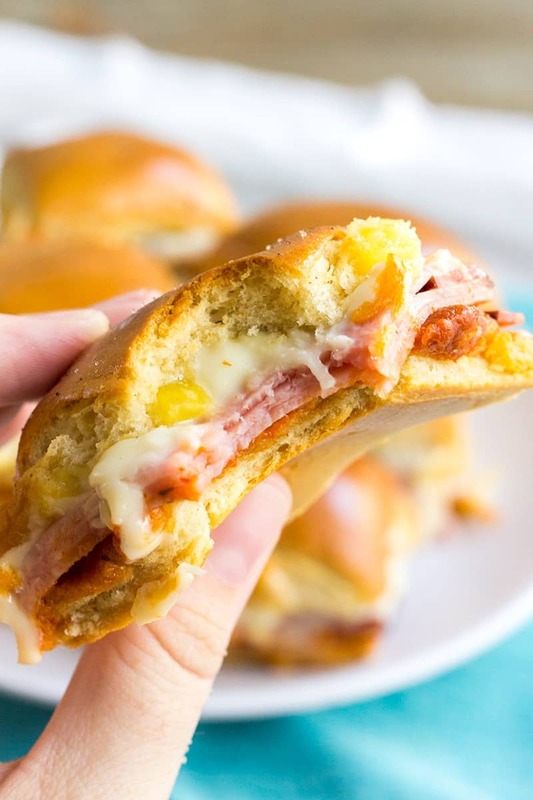 Your party isn't complete until you serve up these Hawaiian Pizza Sliders! Loaded with all your favorite pizza toppings, they are always a crowd favorite! Unwrap the dinner rolls and use a bread knife to cu the rolls in half so all the tops are separated from the bottoms. Set the tops aside, and place the bottoms on a baking sheet (cut side up). Spread the pizza sauce over the bottom half of the rolls, going all the way to the edges. Sprinkle the sauce with Italian seasoning. Layer ham slices over the pizza sauce. Depending on the size of your ham slices it could take more or less ham to cover all the rolls and get a good layer of meat. Use your best judgment on this. Top the ham with slices of mozzarella cheese (I got mine from the deli counter). Sprinkle the pineapple all over the cheese, being sure to spread it out for even coverage. You want some pineapple in every bite. Place the roll tops over the pineapple, cut side down towards the fruit. Use a pastry brush to brush the tops of the rolls with melted butter. Sprinkle salt & pepper over the butter. Bake for 15 minutes, or until the edges of the rolls are crusty and the cheese is melted. Carefully remove from the oven. Cut the sliders apart with a sharp knife once they are cool enough to handle. Transfer to a serving plate and serve immediately. You use regular dinner rolls for this recipe if you prefer. So long as they come in one loaf (all attached). 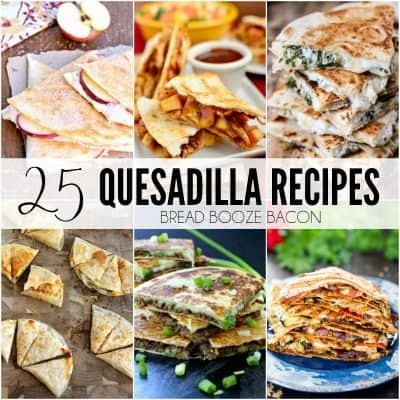 You can substitute shredded mozzarella cheese if you prefer. You'll need 1 cup to 1 1/2 cups depending on how cheesy you like things. Canned pineapple tidbits that have been drain can be substituted for fresh pineapple. 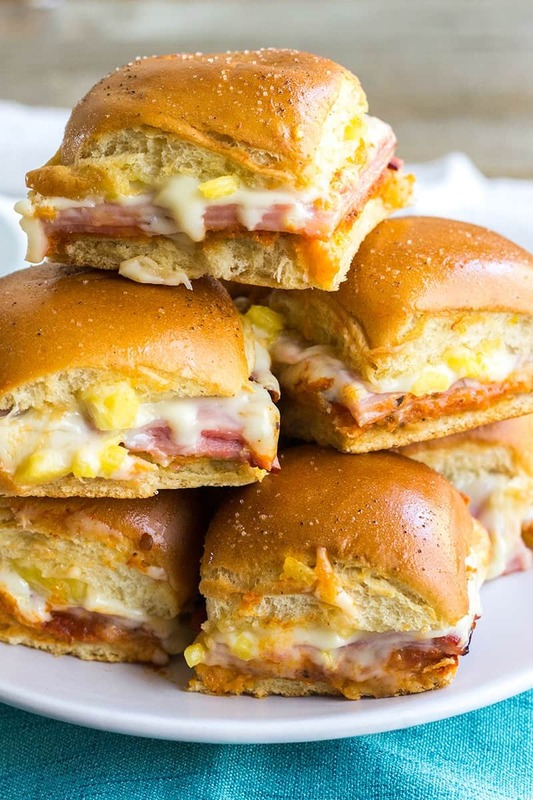 Hawaiian pizza is seriously my FAVORITE so I am so excited to see that you turned these into sliders! Brilliant!! Ahhh These are totally my jam Julie!